1. 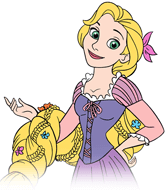 Which among the following activities is not among Rapunzel's usual morning line-up in the song 'When Will My Life Begin'? 2. What is Mother Gothel's nickname for Rapunzel? 3. When Flynn sees his wanted poster, what facial feature does he complain 'they just can't get right'? 4. What color does Flynn say the Snuggly Duckling pub smells like? 5. What is Flynn Ryder's birth name? 6. Flynn repeatedly mistakes chameleon Pascal for what animal? 7. Which actress provides the voice of Rapunzel? 8. Hookhand's dream is to be on stage playing music from which famous composer? 9. While being led away by the guards in the prison, Flynn sees a small ceramic item which hints at the Pub Thugs' being near. What is this item? 10. Where in the tower does Rapunzel paint the lanterns in the sky?